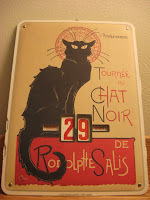 You didn't seriously think I was going to let 29 February go unrecognized on this blog, did you? Clearly you don't know me very well. February is really weird. In non-leap years, it seems so abrupt when the calendar flips from 28 February to 1 March, as though February got gypped. Which is pretty much true. But today, even though 29 days is still shorter than any other month, it just seems like February is unnecessarily "hanging around." I don't know. I still find these quadrennial intercalary insertions fun, though. And if you think about it, this little "glitch" in the Gregorian calendar is that bad compared to possible alternatives: The Hebrew calendar inserts a month in 7 out of 19 years. Heck, the calendar system I made up has an extra 39-day month every 12 years... it doesn't make my calendar less accurate (although it does drift from the seasons), it's just more inconvenient for a greater number of people and on a grander scale. Can you imagine being born in a month that was only observed duodecennially? Granted, that being said, it is Fimadin 27 Negkamun 8 on my imaginary calendar-I-never-use-but-have-a-computer-program-to-calculate-anyway. And quite frankly, that "date" matches up nicely with the weather outside right about now. Speaking of which, it's pretty bad, which is why I'm glad that I only had to walk between two buildings today. It was fairly slippery and snowy as I was walking back from my last class, when I saw some kids making snowballs and throwing them over the construction area off the side of Benedum Hall toward the street on the other side. Sadly, I was one of the only people leaving the building at that time, and they quickly saw me as a good target. Rather than running away and inevitably slipping on the slush, I kept my amused eye on them until I got to the stairway that would take me from the plaza to the street level, still genuinely interested in their activities, but pretending to be naïve to their plans. But between them and the stairs is a big auditorium building (which won't be there soon), which would give them an opportunity to sneak up on me. So as soon as I rounded the corner, I turned around on the step, and knowing how many steps were in each set (because I'm a nerd), I cautiously and slowly walked backwards down the stairs. And I just laughed when I saw each of them peeking around, hoping I wasn't looking... only to have them see my eyes looking straight at theirs! Anywho, the nasty weather is preventing the ΜΚΥ camping trip from starting as planned. Instead of leaving for the campground in Farmington, PA this afternoon (in which case I'd already be gone), we are going to someone's house for the evening before making our way to the campground tomorrow morning. I'm sure it will be just as much fun. But back to leap-yearing and intercalation (which are both fun words). I was fortunate this year that my watch has a "minus" button to page backwards through the numbers, because, as usual, it jumped ahead to read "3/1" at midnight. In the past, this would have meant going through all the months and days to get to "2/29," but it ended up being a quick and painless fix this year. At least we make an effort to have our years match up to something, though. My made-up calendar has a 362-day year, which is fairly reasonable, and when you add the intercalary month, you get 4383 days in twelve years... exactly the same as we get with the real one. But my high school friend Jaci once made a calendar with six 64-day months... 384 days that continuously fall out of cycle. Similar to mine, it's an imaginary calendar-we-never-use-but-Tim-has-a-program-so-he-can-calculate-it-anyway. And today is Friday 16 Molybdenum 5. Can you tell this concept was designed in Chemistry class? No, she didn't get uncreative with the days of the week. On her calendar, tomorrow is Tuesday. And the next day will be Tuesday as well. In fact, the week is comprised of seven Tuesdays and a Friday. Today just happens to be special in a coincidental case. Then there's the calendar my brother decided he wanted to make. It's so convoluted it's not worth explaining, but one should note that it alternates between 5- and 13-day weeks. Anyway, today is Uvuladay 20 Shrub 1. Yes, he named a day of the week after the uvula. No, I don't know why. It's quite clear that this is just arbitrary stuff. Certainly on those other "calendars," this would be a normal day. And for the most part, it is. But this day is certainly special to us, even if for arbitrary reasons. I think it represents a willingness to accept that things won't always delineate themselves cleanly enough to satisfy our scientific drive to "quantify." Really, if you think about it, science boils down to a bunch of empirical equations that mean practically nothing to the casual observer. The reason? Because the quantities expressed by these equations are often so abstract! I think it's amazing that scientists over the years developed a method for quantifying some really crazy concepts. What does 24 kJ of energy feel like? What does it mean to have your entropy increase by 1 J/K? You can't answer these questions... and yet, part of science is being comfortable with the fact that we can only observe the effects of these quantities and not the quantities themselves. Wow. That was a tangent. Anyway, I was in my ChE Thermodynamics Lab yesterday, and my group and I were doing some stuff with compressing carbon dioxide at different temperatures to observe a liquid-vapor transition (at normal pressures, it goes straight from solid "dry" ice to vapor). The apparatus was attached to a really old computer which was taking data the whole time ("really old" as in "it was running Windows 98"). Oh, wow. What is that thing? It looks familiar... How does it work? It's so amazing! 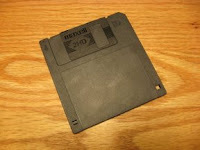 WHAT DO YOU MEAN, "IT ONLY STORES 1.44 MB"?!!!??? Haha. Good thing the data were only 102 kB. So then I had to go to the computer lab and rent a drive for this contraption. Apparently, just like scanners, you can go up to the desk and lend them your ID card, and they'll lend you a drive that plugs into a USB port. So now I actually do have the data on my USB drive (yay!). I just found that interesting. I mean, I can accurately say that it's been years since I've used one of those things. And, in other news, let's go back to the land of Silly Animals, a group of imaginary friends my brother and I had during our younger years that sort of fizzled out around 1999. 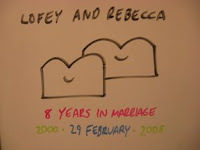 Today is Lofey and Rebecca's second anniversary. Happy anniversary, Lofey! Here's the gift I gave them: It's a photograph of the happy couple, can't you tell? I just got off the phone with them, and they are doing quite well, as are all of Lofey's siblings, Lofay, Lof-eye, Lofoh, and Lofoo. Now, I did say that we didn't pay much attention to Silly Animals after 1999, but the wedding date had already been set. Of course, 29 February 2000 was a Tuesday, so that's a bit weird for a wedding, but then again... Did I mention I was a weird kid? 1: Apparently, there's an event going on in a lounge in my building tonight entitled, "Happy 5th Leap Year Party!" Excuse me. Many of the sophomores in this building are 20 now, and thus this is their sixth leap year. 2: I bought a new air freshener yesterday, and it's really quite fragrant. Almost excessively so. I don't think any room needs to smell that much like "After the Rain." Then again, who's to say that's what it smells like after the rain? Quite frankly, I usually smell wet socks after the rain. Oh, no! I've been duped by a fragrance-based commercialized lie! 4: Jen is still singing the "Kenya" song that's been stuck in her head for about a month. In the past, I've yelled at her for not being considerate to the Kenyans in their time of political instability, but in theory, that's all over now. 5: Me? I got a creative burst and started writing a song on 17 February, but it hasn't gone anywhere yet... mainly because I've been too busy. Perhaps today would be a good day to do some work on that... I mean, 29 February has to be good, right? 6: Speaking of good days to do big things, the new Heinz Chapel Choir website that Joanna and I made went online in the wee hours of this morning! Check it out! 7: When I was uploading things to another site, I noticed that my FTP program doesn't like Leap Day. Any time it adds timestamps (and since the one server in on Mountain Time, I tell it to), it just adds the hours, but the way it recalculates the date ignores 29 February in any year. So according to that program, I uploaded some things tomorrow. 8: I'm tired, and this post is long enough. Peace out! wow that was incredibly long. I turned to my husband last night and said, "Isn't it strange that there are five Fridays in February this year? I bet the next time that happens won't be for a hundred years." To which he just turned his head slowly and looked at me like I am some kind of crazy nerd. Of course then we both started laughing. But seriously, when will the next year there will be five Fridays in February? I really want to know! Very nice... Very nice. May your days be merry and briiiight! And may all your Christmases be white. We decided, after a lively party, that we're meeting up at 10:00 to go to Farmington, but for the most part, we're all sleeping in our own beds tonight. Hopefully the weather will hold overnight. Andrea (Lexi Elizabeth) - Only 1673 words. That's much shorter than my normal ramblings. Bev (Anonymous) - Except when crossing century years that lack Leap Days, the day on which Leap Day falls moves backwards two days each time. In 2000 it was a Tuesday, 2004 a Sunday, 2008 a Friday. In 2012 it will be a Wednesday and in 2016 a Monday. So except when crossing such boundaries (which won't happen in our lifetimes), it's seven leap years before you get back to where you started, or 28 years. The last time February had five Fridays was in 1980. The next time will be in 2036. Will (timeriaco) - Thank you for gracing us with the presence of that song. Is it sad that I know exactly what your text comment actually sounds like? I should add that I had five Statistics recitations and thus five Statistics quizzes this past month because of the intercalation. In March, because one Friday leads into Spring Break, one is Spring Break, and one is right after our next exam, I will have only one quiz. Interesting sidenote: In 2009, the 28-day February begins on Sunday, which puts the entire month in just four rows on the calendar instead of the usual five (or six). The last time this happened was in 1998 and it won't happen afterwards until 2015. February 2004 also started on Sunday, but Leap Day threw off that particular novelty. I wouldn't say it's sad, but I'm sure you'd prefer to imagine yourself singing that song rather than me. I guess I was way off thinking it would be 100 years until another five Fridays in a February, but 28 years is quite a bit. I was in 8th grade the last time it happened! Have you fixed the Name/URL yet? Since it won't let me simply put in my name, I guess not. This is an issue on Blogger's end. The simplest solution is just to use a Google Account and sign in that way. I thought I'd disabled anonymous comments, and since apparently I haven't, I plan to soon. You'll miss my witty comments until they fix it. anyways, you and i should talk?